In Recore, you fight as Joule against evil killer bots. Here you can get help from friendly bots that exist throughout the game in many versions. Also, you can modify them at the workbench and improve in order to guard against all enemies in New Eden. At the beginning of the game a robot dog, Mack is already there for you as companion. 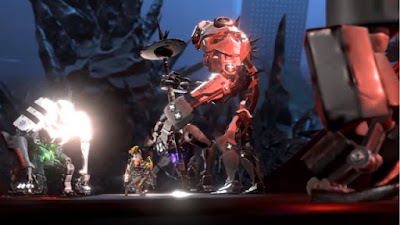 In Recore, you soon learn that you can command your friendly dog to attack an enemy. You will also find out that Mack has a special ability. He is an exploratory Bot and sniffs for you by collecting items in order to dig them ultimately. Other core bots have other special abilities to help you. In your crawler you have a workbench. Jules can collect resources in the game and extract enemy’s cores. Upon entering the crawler, all items from the inventory will be transferred to the camp. Also, you can create from one corebot to another companion in order to customize further every personality. Here you have to fix the personality chip in the shell parts of other bots. But for that you need blueprints. They are usually hidden in big boxes. They provide you useful shell parts for your bots. If you choose to work on the blueprints in the workbench, the resources required for the production of the part are visible on the map. Each corebot has special attacks. Small, blue flashes in the top left to show you how often you may be able to use them. Boost your energy of bots with blue fusion energy, they load up faster. Destroy crates with your weapon to collect Blue Shards. They increase the number of special attacks. Mack is the first companion in Recore that has a blue core with a K-9 Cover. So he is most effective when he uses it against blue enemies. He can also sniff the ground to find rare resources for you. He jumps in the fight against opponents and inflicting massive damage. Seth is the second companion that you will encounter during the major mission. He has a SP-DR-shell and a yellow core. Therefore, he is particularly effective against yellow enemies. With Seth you can climb magnetic transport rails that takes you all over the world. In battle he releases a barrage on his enemies and shares significant damage. Duncan is a giant bot with tremendous power. Over the main quest you encounter him in the northwest of the map. Its shell is type of AP 3. He has a red core and can smash rocks to get you special items. In battle he throws enemies against fireballs, he is especially effective enemies with a red core. The FL1-R Corebot is an optional companion. You have to find its parts in boxes and collect the corresponding blueprints. The bot can overcome its larger gorges by hangs on slides. Between some rocks, there are air currents that can use your bot to get drive and lift off into the air. In battle he shoots laser flashes against enemies.